I uploaded a bunch (one-by-one ...) and when I go to the Library in the mobile-app the attached error displays. I reviewed the files in a text-editor and it looks like it's supposed to (details in the other thread with similar name from 6 months ago - reply given by TheJuggler). 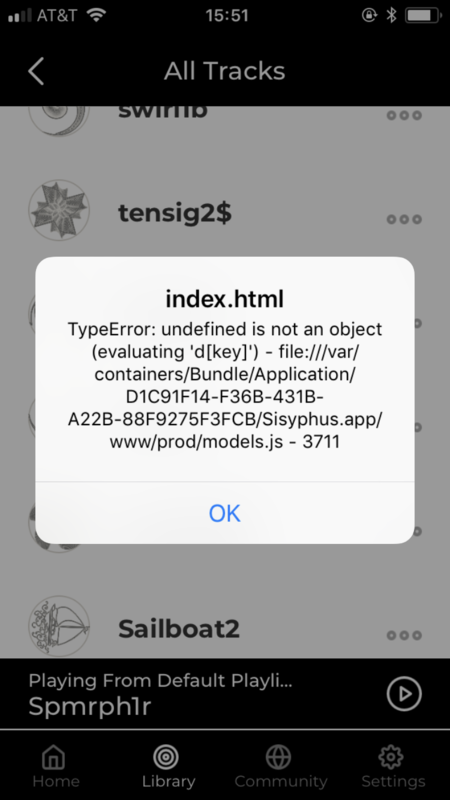 In addition, when I upload a track through a browser, I get the same error message as elsie above regarding (evaluating 'd[key]') popup on the app. 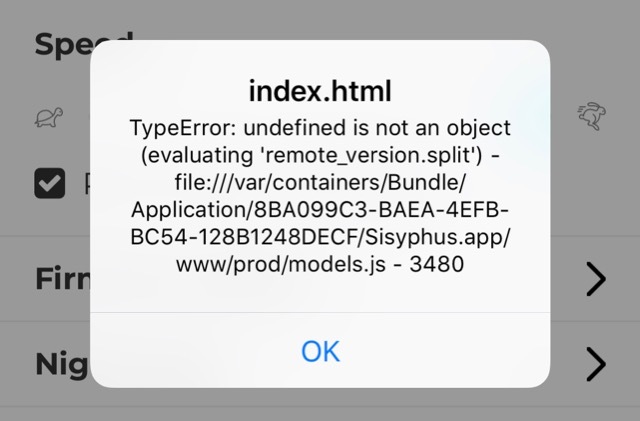 I've received the same error message. For what it's worth... I ran into a problem that "may" be similar to what caused yours, and it turned out that one upload must have gone bad because after deleting the problem file, not having the problem, then re-upload the same file, my issue has gone away. I have been uploading tracks, running them completely before uploading another, and ran into a problem where I could not reach my table (thru web or app) unless I hard reboot it so I knew it had to be one of the last few files I uploaded. The bad upload caused the problem to happen when I ran the file and the file before it, but not 2 files before it, seemed odd that would be the behavior but I mention it in case it's helpful. Uploading this way makes it a long process to have more tracks, but I love my table and want it to continue working flawlessly like it has for the past year, so that's what I am doing. Thanx. I’ll give the “run before next upload” a try. I was uploading all (one-by-one: waiting for completed confirmation before starting next) then trying to run: none appeared in the library. just my luck the first one would be corrupt. is there a way to tell if file(s) are bad before trying upload? All came down from Dropbox with correct file-extension and appeared to be appropriate size. Sorry (to all) about the recent issues cropping up related to track uploads, and error messages. We had some issues with our server over the holidays, and it caused at least some of the problems being reported. Please bear with us - we met with our lead dev today and formulated a plan to get things working better. With regard to tracks on the Dropbox being corrupt - they have all been checked prior to putting them up, and should not be corrupted. Let us know if you fins a file the repeatedly causes problems (and send it to us if you can). I have run into a couple files that caused the same issue, and no, I cannot see anything wrong with the file, it actually seems to run fine, but I can't reach my table unless I unplug it (I always wait a full 10 seconds before re-plugging with electronics). I don't believe the file is originally corrupt, but something happening with the upload process to the table. I'm no techie, but my guess is that the wifi connection just isn't always perfect and causes something weird to happen arbitrarily. I'm patient though because I know this project is still so new and little quirks are bound to happen. Micah has seen an uptick in reports like this and has contacted our dev team with the info. Will fix ASAP. Any updates on this, I still can't upload any tracks. We spoke to our dev and he said it's now fixed. We are just waiting for it to get pushed to our "master" branch which will make it read for download via firmware update. Should be today or tomorrow - will post here when ready. OK, it's pushed. You should now be able to update to version 1.10.15 - let us know how it goes! Just wanted to let you know it worked perfect!! Thanks so much.